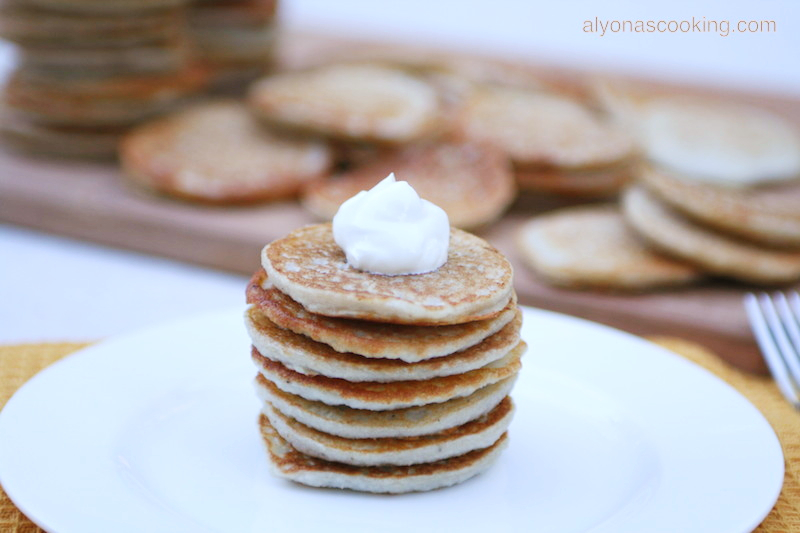 These potato pancakes are a Ukrainian Classic and the good news is, you don’t even have to grate the potatoes! Originally the potatoes are finely grated and tossed in some flour, eggs and seasoning to create a perfectly moist and delicious pancake. 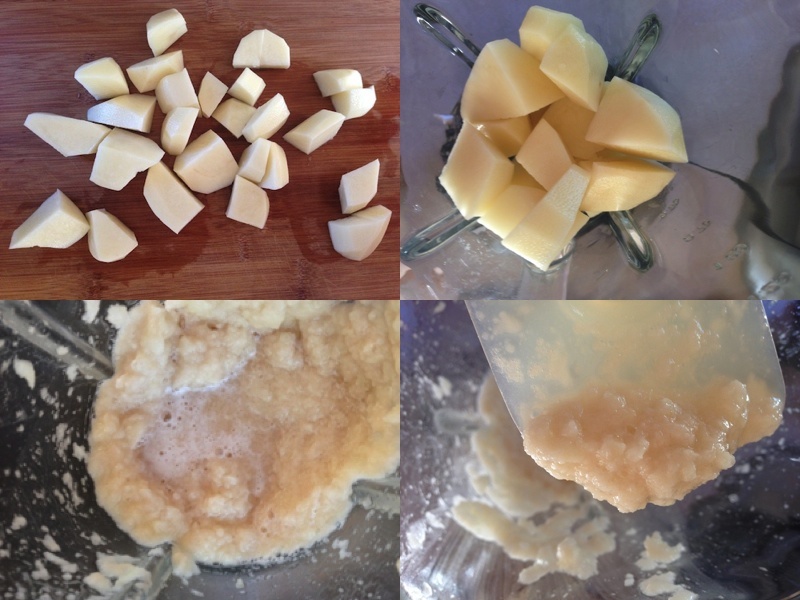 However the potatoes in this recipe are pureed in a blender and the results are just as good without all the grating. 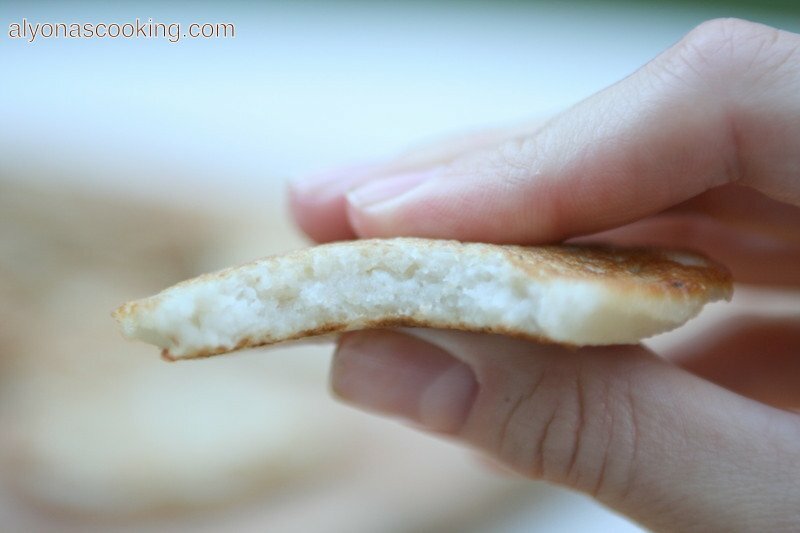 There is probably many different variations on how to make these classic pancakes but this recipe is basic and very tasty. 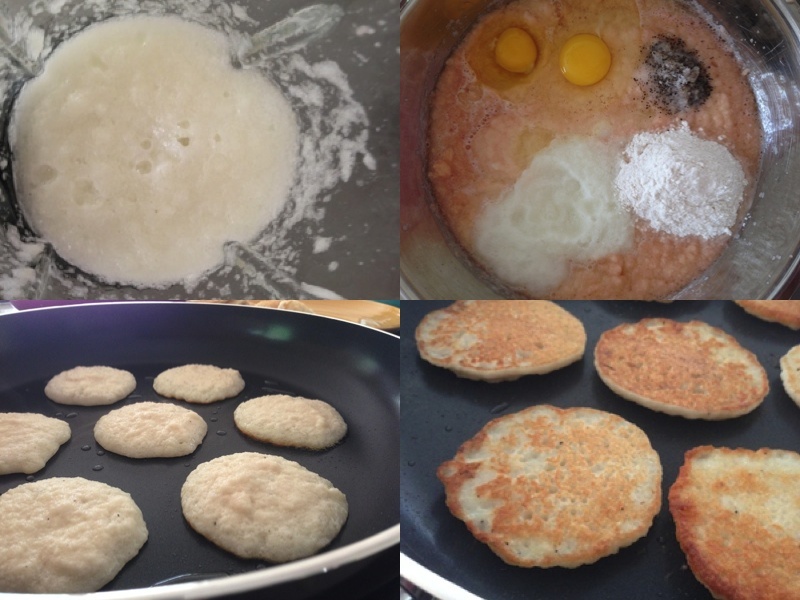 The texture of these pancakes are quite different from ordinary hash browns. Since the potatoes are blended (or finely grated) natural juices release and form a moist and soft inside with a slightly brown exterior. You need to try this quick blender version! 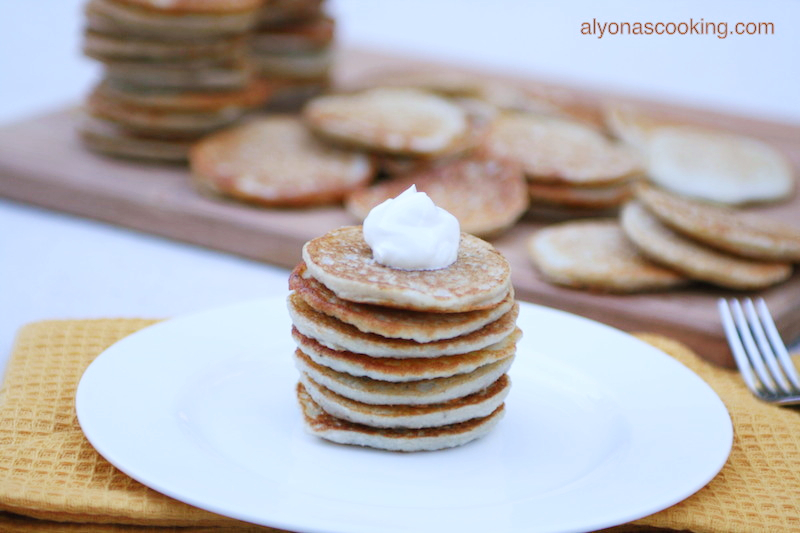 Serve with sour cream and you have yourself some delicious pancakes from potatoes in no time. Peel, wash and cube the potatoes. Working in small batches, blend the potatoes pulsing and blending until a puree like consistency forms. Do not add any water or liquid to the potatoes when blending. The potatoes will release natural juices. Transfer pureed potatoes to a large bowl and continue working in batches. Peel and quarter an onion. Place quartered onion in the blender and puree; add to pureed potatoes. Whisk the pureed potatoes, pureed onion, flour, salt & pepper and eggs. Heat a few teaspoons of oil in a large non-stick frying pan over med-low heat. Stir batter and pour 1/4 cup full of the batter to the hot pan. Mix batter very well after each addition as liquid can form on the top. Add oil to the frying pan after each addition to prevent any sticking. 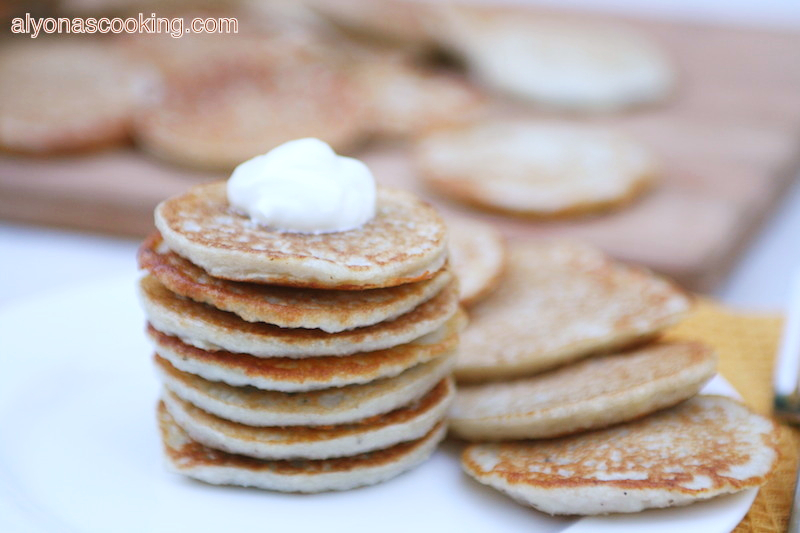 Transfer ready pancakes onto a large plate and stack. Serve with a dollop of sour cream. 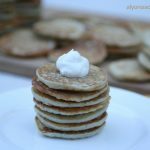 These potato pancakes are a Ukrainian Classic and the good news is, you don't even have to grate the potatoes! Originally the potatoes are finely grated and tossed in some flour, eggs and seasoning to create a perfectly moist and delicious pancake. Peel, wash and cube the potatoes. Working in small batches, blend the potatoes pulsing and blending until a puree like consistency forms. Do not add any water or liquid to the potatoes when blending. The potatoes will release natural juices. Transfer pureed potatoes to a large bowl and continue working in batches. 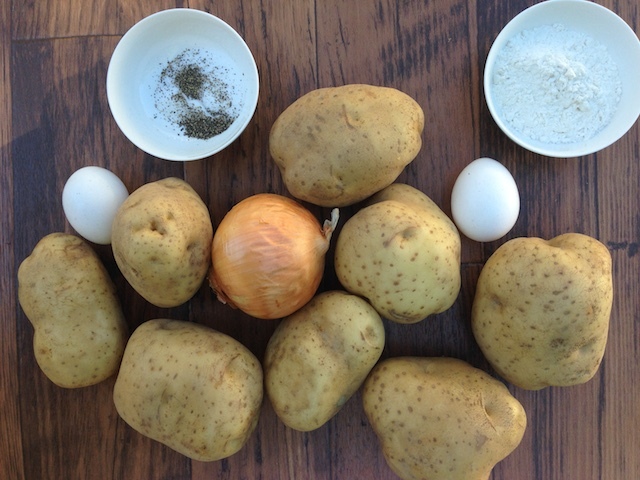 Whisk the pureed potatoes, pureed onion, flour, salt & pepper and eggs. Heat a few teaspoons of oil in a large non-stick frying pan over med-low heat. Stir batter and pour 1/4 cup full of the batter to the hot pan.